Last year, for the first time, I joined my church on a 21 day fast. 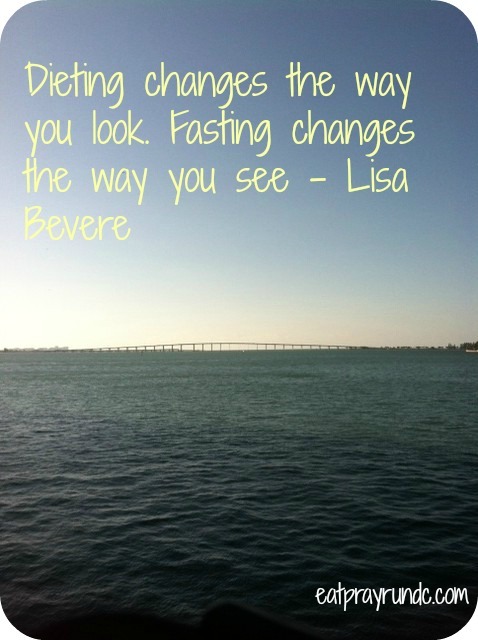 I chose to do a Daniel Fast – which means essentially keeping a vegan diet and eating no processed foods. It was a great time of prayer and really allowed me to reset and focus on drawing closer to God. You can read more about my experience with the Daniel Fast last year here, here and here (and check out my Daniel Fast pinterest board with lots of recipes here). This year, because of my somewhat intense running schedule, I decided to change my fast up a bit. I’m fasting red meat + sweets. Normally the sweets thing wouldn’t be a challenge at all but I’ve been on candy overload since my office has been inundated with sweet stuff since Thanksgiving, it seems. I’m looking forward to this season of clarity – especially since “put God first” was one of my goals for 2014. Do you do any kind of “reset” in the new year? I was also trying to reduce my sugar intake by cutting out sweets but I haven’t done so well. Hopefully yours will go better! Thanks Meranda – maybe you should go cold turkey like me?? I’m glad to hear you weren’t going all liquid while running. I did a juice cleanse for 3 days and found out it wasn’t for me. I eat fairly clean about 85-90% of the time, but I do wish I could cut out a few carbs, but now that I am marathon training, I know I need to keep them in my diet. Good luck with your cleanse! I don’t really reset anything. Normally I might, but right now my life is in such a state of change that I can’t imagine changing my diet as well. OHH i love the idea of doing it with a group who is focused on more than just “weight”. I think that support would be great! Hey Girl! My hubby and I just finished a 21 day fast with Jentezen Franklin’s church! We love starting out our year this way, and it really refocuses us on our walks with God!